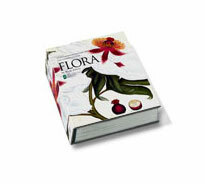 Flora: An Illustrated History of the Garden Flower won the Garden Writers' Guild Award for Enthusiasts' Book of the Year 2001 and is still a bestseller. Scriptum Editions now publish this unique book in miniature form at an incredibly affordable price. With chapters dedicated to Europe, the Turkish Empire, Africa, Asia, Australasia and the Americas, Flora unfolds with beautiful illustrations of the flowers that originated there. Including 300 hand-selected full-colour illustrations from the Royal Horticultural Society's Lindley Library and featuring all the major floral categories, as well as some fascinating rare varieties, mini Flora is the perfect gift for any flower lover.